Dell is known for consistently putting out some of the best laptops around, but one of the company’s lingering problems has now been solved through the latest XPS 13 model. Dating back to the 2015 model, the 13” thin laptop had one glaring problem: a terrible webcam placement that gave viewers a glorious look of the inside of your nose thanks to its tiny bezels. That’s now been corrected. Dell’s most award-winning product ever has a new top-mounted webcam that’s 2.25 mm wide, making it the company’s smallest HD webcam. 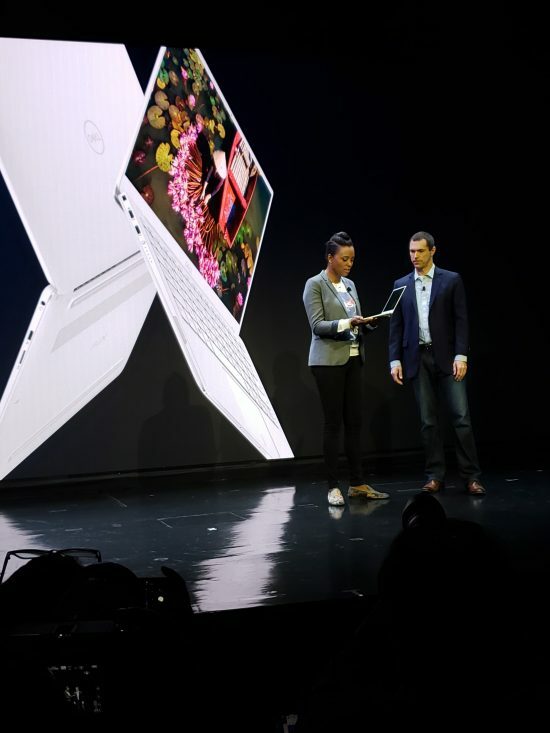 Actress Aisha Tyler and Dell’s Jay Parker unveil the new XPS 13. Photo by Alex Coop. Beyond that, the laptop doesn’t boast too many notable upgrades. Its i3, i5 and i7 versions have a new, faster 8th generation Whiskey Lake processors, a new white colour option and support for Dolby Vision. A subtle but welcome upgrade is the adjusted hinges, making it easier to open. But let’s get back to that webcam. Dell’s president of client product group Jay Parker said its teams have been working for more than two years to miniaturize the webcam so it can fit on the XPS 13’s tiny bezels. As a result, the laptop becomes a very compelling product, even if the tiny webcam means no Windows Hello support. It does, however, come with an optional fingerprint scanner for biometric logins. The machine also offers strong visuals with Dolby Vision and Dell Cinema on a 4K Ultra HD InfinityEdge display. Dell’s latest Latitude 2-in-1 drew significant inspiration from the XPS lineup, specifically when it comes to the small bezels and weight of the device, but despite the similarities, they are still targeting different audiences, said Rahul Tikoo, vice-president of commercial client mobility, commercial, Latitude for Dell. While he didn’t go into details, Tikoo hinted at significant changes to the Latitude lineup. The new XPS 13 will be available February, starting at $899.99 ($1,194 CAD) on Dell.com, Microsoft.com, and in limited quantities, in select Microsoft Store locations. *Alex Coop is attending CES 2019 as a guest of Dell’s. Dell covered hotel and travel expenses. Dell does not review this content before publication.